Protecting your home is important, that’s why we only use the best termite treatment products available. From Termidor®, the worldwide leader in liquid termicides, to the Advance Termite Baiting System®, the leader in termite baiting technology, you can rest easy knowing your home is protected. Termites follow tree roots and construction conduits such as pipes and footers to gain entry into homes. The Advance® Termite Bait System can intercept colonies before they reach your home. It is recommended that a professional inspect your home to identify the presence of termites. How can you tell if they are present in or near your home? “Mud tunnels” appearing on or around the foundation. Baseboards and floors which may sound hollow. Dead termites or termite wings on window sills or along walls. Most importantly, call a licensed and trained pest management professional who can inspect your home and assess what level of termite protection is needed. Termites cause nearly $2 billion in damage annually according to research. Unfortunately, without annual inspections, termites can go unnoticed for years while continuing to damage your home. Most homeowner insurance policies do not cover termite damage. Many pest management professionals offer annual inspection services and treatment guarantees. The best solution to potentially avoid termite damage is a professional, thorough annual inspection and a termite bait system to detect termite populations and eliminate them around your home. 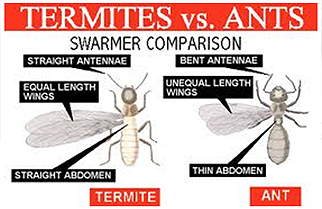 How can I tell the difference between a flying ant and a swarming termite? We employ certified technicians to ensure that you get the very best results possible. We have 24 hour service, a fully staffed office and evening appointments are no problem! We serve the Eastern Shore of Maryland, the Eastern Shore of Virginia, and Sussex and Kent counties in Delaware. Contact our office today to schedule your free consultation!